← The Declaration is Available! My latest novel is ready for download at http://www.amazon.com/dp/B00ZNTCJPC! The trilogy consist of three books (in order): “The Convention”, “The Green Zone”, and “The Declaration”. The idea for the trilogy was introduced in my third book back in 2010 called “The Cell – Twilight’s Last Gleaming.” The events in the trilogy take place several years before “The Cell” and set the stage for the America portrayed in it. After six years of a failed presidency, the United States of America teeters on the brink of another collapse – not another economic collapse, but a collapse of confidence in leadership. The healthcare system is in ruins, the borders are undefended against terrorists, the national debt is spiraling out of control, and the political system has grown increasingly disconnected from the American people. 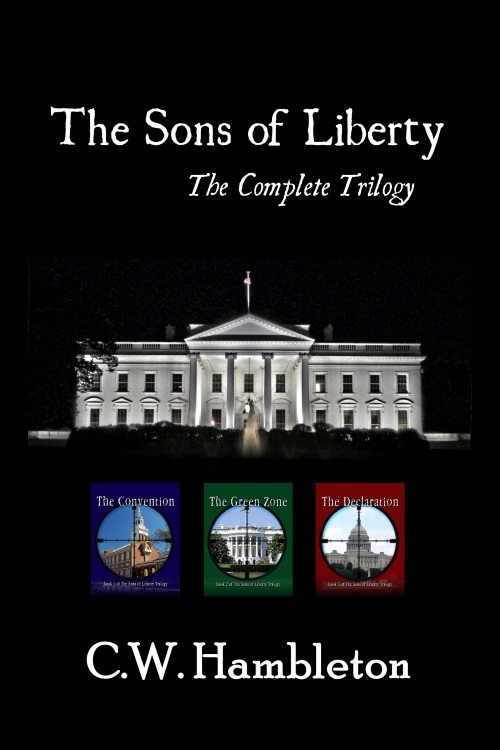 When the federal government shuts down over another budget conflict, a group called the Sons of Liberty issues an ultimatum to the Capitol to get their act together – or else. If the House, the Senate, and the President cannot resolve their differences and rein in the out-of-control spending and bureaucracy, violent action will be taken. After the first shot is fired between Homeland Security and the Sons of Liberty, the powder-keg brewing at the capital explodes. As the conflict between Washington and the rest of the country begins to spiral out of control, a group of state legislators sets out to hold a Convention of States in hopes of pulling the nation back from a civil war.. The trilogy is also available for the Nook and in paperback format.